I first came to the Islands when I met a few of the locals on a night out in Copenhagen. After an hour or two they invited me to stay over in the Faroes, so I took up the offer. The moral of the story is to never invite anyone to come visit, unless you mean it because weirdos like me will turn up on your doorstep! When I was looking into the tattoo scene on the Islands, I couldn’t find any tattoo shop to guest at but I took my gear with me anyway. At the time, the tattoo laws seemed pretty none existent over there but strangely enough when I arrived I heard that Terji Skibenæs, the well known guitarist of Tyr, had just opened a tattoo shop the day before in Torshavn where I was staying. Torshavn, otherwise known as Thor’s Port, is the only city on the Islands and easily houses half of the Island’s occupants so it wasn’t a massive coincidence really. 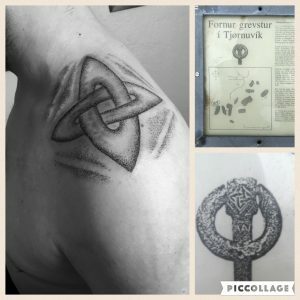 After fighting my way into the museum (its closed almost all the damn time), and talking to my new found friends on the stories and myths of the place, as well as visiting archeological sites, I set out to do some tattoos on the right individuals to bring all these ideas together. 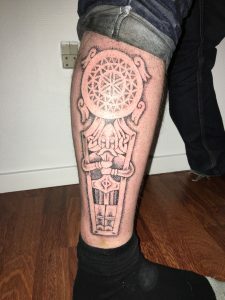 My friend Teitor is also massively into ancient history and culture, so we combined a few elements together to create this tattoo on his leg. Since Christianity wiped out almost all of the Island’s Pagan past, we pieced together a few things to create this. Thor’s Port speaks for itself as to why Thor is the centre of the design. The shape of the border encasing Thor comes from the Island’s wood carving tradition that is abundantly present in the museum and at the Kirkjubøargarður. Wood was, and still is, extremely valuable in this remote place so a tradition of ornamenting wooden surfaces seems to have become quite important. It’s undoubtably paralleled with the Medieval Norwegian tradition of woodcarving items like wooden cloth smoothers. This was done by bachelors to gift to single maidens to show their devotion and ask their hand in marriage. It’s also mirrored in Wales with the spoon carving tradition but that is a story for another time. The Flower of Life Pattern is also from the Kirkjubøur farmhouse. It’s fascinating how this symbol pops up in so many cultures… It is probable that it was spread by individuals, probably Christian Missionaries, yet it is also possible that it was observed from nature and appeared in art as a consequence of this. In Northern and Western Europe it is usually only displayed as the single symbol, not as part of a continual pattern as it is seen in the East in ancient times. 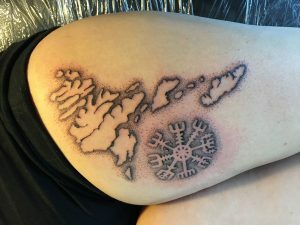 This is a map of the Islands and the Icelandic Bind rune known as Vegvísir on Tordis, another good friend of mine. 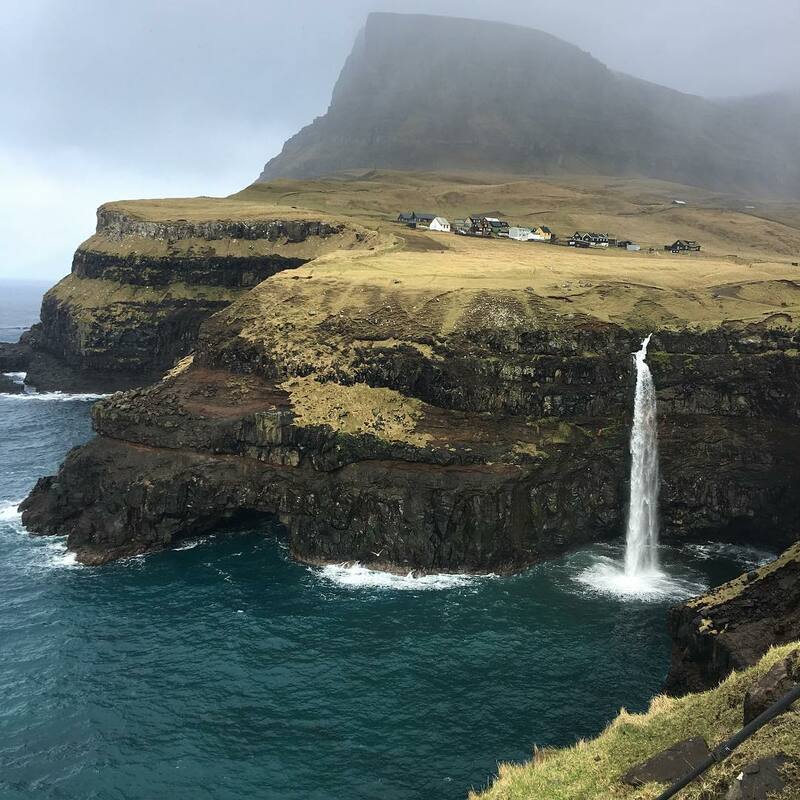 The Faroe Islands are the closest lands to Iceland and have always shared a special connection, being so remote and disconnected to Scandinavia where its original inhabitants mostly came from. 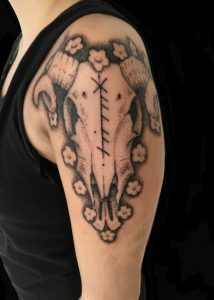 This sheep skull and Bindrune is on yet another friend of mine, Una. The flowers depicted are native and exclusive to the islands, and symbolise the number of islands that make up the Faroes, and of course the sheep skull is to represent the sheep that have sustained the Islands since they were settled over 1200 years ago. There is evidence that the Islands were possibly inhabited from time to time before this, but there is little evidence to support that these peoples survived until the Western Norse came to settle and became the modern Faroese. The Bindrune is to represent Una’s family and heritage. The original Faroese sheep went extinct because they were so suicidal .. if what the locals told me is correct. This tattoo was done on Hsnus, and yes you guessed it, he’s a friend of mine! 😀 Together with his wife Marjun we went to an ancient burial site close by and they introduced me to this cloak pin that originated from Viking Jorvik, now known as York, England. The pin is in the museum there and the detail on it is so small and fine. We took the knot, blew up the size of it to work as a shoulder tattoo, and hanpoked it under the Northern Lights, or at least that’s the romantic way of putting it. Somebody went out for a cigarette and came back in, informing me that the lights were pretty good tonight. It was my first time seeing them, so it was quite special for me. They really do dance and change colour just as they seem to do on film… I always thought maybe they sped it up or intensified the colours but I was wrong! When you see the Northern Lights it really is easy to understand how our ancestors believed it was our Gods dancing in the night’s sky.